Schwartz & Wade, 9780375846298, 22pp. 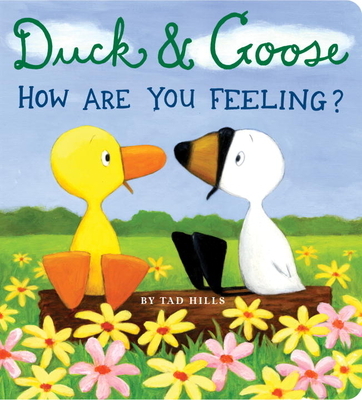 Duck and Goose help toddlers learn about their feelings in this board book that's perfect for reading 1, 2, 3 times per year and more! Duck and Goose are back in their third board book appearance. All the favorite characters, including Bluebird and Thistle, return—this time to help toddlers learn about their feelings. Following on the heels of the hugely successful What’s Up, Duck? and Duck & Goose 1,2,3, this charming board book uses simple text and colorful illustrations to help preschoolers identify familiar feelings like happy, sad, scared, and proud.